If Curtain Wall is the outermost piece of ice protecting a server, it has +4 strength. Curtain Wall has some interesting applications along with its absurd cost and a major weakness. Once played, you will sacrifice 4 strength to play anything beyond it, which is a huge blow to its usefulness. It is meant as a capstone to tax the runner out of a server; the final word. 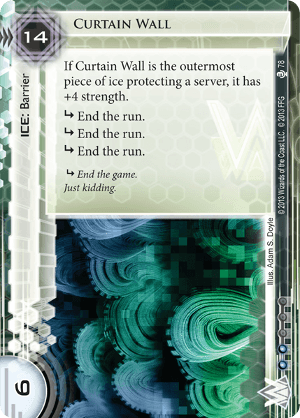 However, Hadrian's Wall, for the same cost, has one more power and one less subroutine, without the downside of playing more ice (disregarding clicks to advance it, though). Curtain Wall can only get weaker as the game goes on. As one of the most expensive pieces of ice in the game, it lacks the sheer crushing power of Janus 1.0, and as discussed, is not as good in the long term as Hadrian. So what would make you want to include this? Blue Sun. The ability to regain 14 from this ice and be able to reposition it is hugely powerful! Regaining the credits to use on other ice is a massive economic boon. Or, for the cost of one Oversight AI, get 14 next turn! It is hugely useful in Blue Sun, or if you splash Sunset or Tenma Line for some reason, but be wary otherwise.